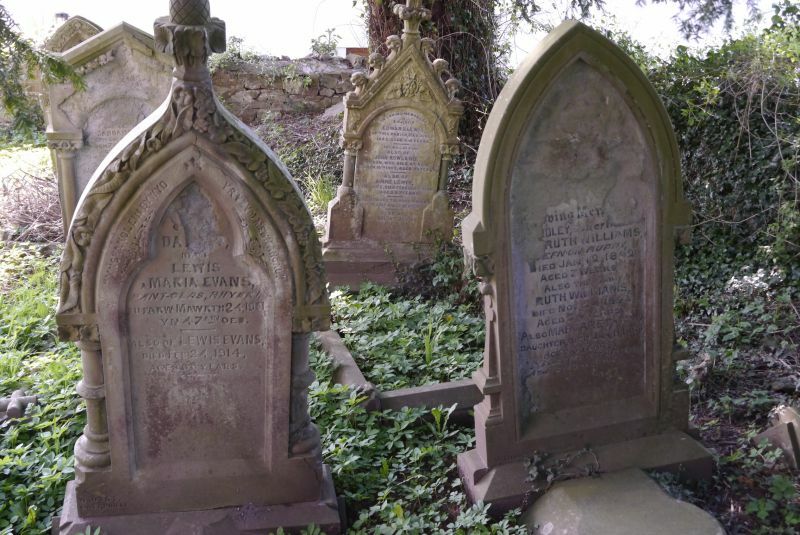 Location: Above S side of a minor road between Caerphilly and Machen, in a large quadrangular churchyard. The earliest reference to the church occurs in 1295. It was possibly founded as a dependant chapel to Bedwas parish church in the mid C13 and remained a chapel-of-ease until 1914. The church was substantially restored by John Prichard in 1885. In 1961 the nave and tower walls were strengthened, while the roof was replaced with concrete tiles. Early-English style church consisting of W tower, nave with porch, and a lower and narrower chancel. Of rubble stone walls and concrete tile roofs. The nave is 3 bays and has 2 C19 lancets with hood moulds and uncarved stops R of the C19 porch. The porch has a coped gable on moulded kneelers and a doorway with 2-centred arch and 2 orders of chamfers without capitals. The chancel S wall has a similar lancet on R side, and a blocked former priest's door to its L. The E window is 2-light with geometric tracery and a hood mould with head stops. The chancel wall is battered at the base on the N side. The nave N wall has a lancet to L similar to S side above a blocked doorway (possibly to former rood loft), and a reset and part renewed C16 window of 2 lights and cusped ogee heads. The 3-stage tower is battered at the base and has a saddleback roof, characteristic of the area. The W door has a semi-circular head and a bullnose surround. The boarded W door has ornate cast iron strap hinges. The middle stage has small blocked windows on the W and S sides, and the bell stage has 2-light flat-headed windows on the N, S and E sides. Internal features belong almost entirely to C19 restoration. The nave roof has closely spaced trusses with collar beams above raking struts. The chancel roof is similar with a boarded ceilure over the altar. The chancel arch is 2-centred, with 2 orders of chamfers. The round-headed tower arch is early medieval. The font is post-Reformation, possibly early C19 before Prichard's restoration. It has a square bowl with wave-moulded sides, on a square pedestal with deep chamfers at the corners. The wooden pulpit is small and has a polygonal front with open arcading. The sanctuary has a moulded communion rail on chased metal posts with foliage brackets. Stained glass in the E window is by W Maile & Son, of 1934. A white marble wall tablet to those who fought in the 1914-18 wall is on the N wall of the nave. Included as a parish church extensively restored C19 but with medieval origins. On SE side of the chancel of St James' Church. In the churchyard on the N side of the nave of St James' Church facing a minor road. On N side of a minor road through Rudry immedietaly opposite the parish church. Located in an overgrown area immediately adjacent to south side of Van Road, east of a track to Tyn-y-parc. Approximately 1.7km NNE of Rudry church, reached by private road on E side of a minor road between Rudry and Bedwas.